Hello everybody, it's been a bonkers few weeks here at Wonder Kids, July was my busiest ever for my Wayne Wonder Magic Shows with over 40 bookings in a month! This included a show for my old primary school. I hadn't stepped foot in the place for about 20 years Then with the schools breaking up I've been distracted with having both my wife (who's a teacher) and daughter at home. Im back today though with a bumper blog post featuring four great Moana fun ideas plus we recently had a trip to Warwick Castle here in the UK so I will write a quick review on that too. 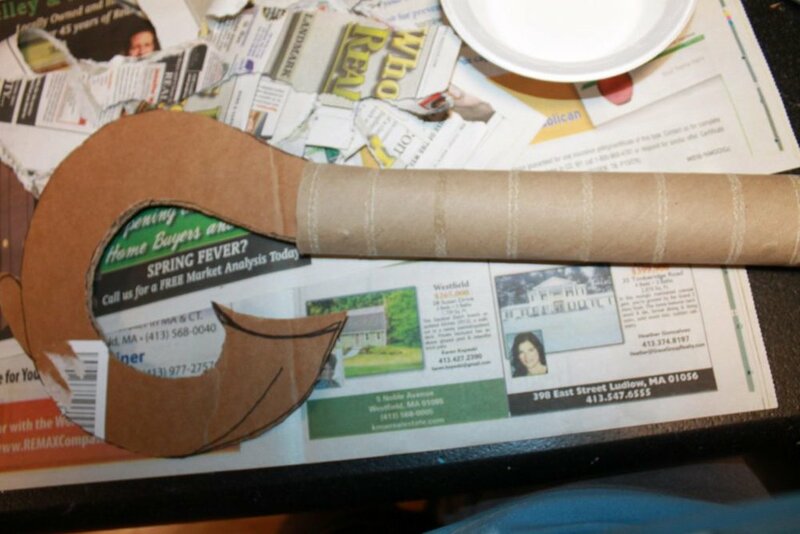 First paint the egg shells and allow to dry, then cut out flippers from the green cardboard. To do this we found it better to cut out large circles and then cut the flipper shape into the large circles leaving a central base to glue onto the egg shells. Glue the pom pom heads onto the egg shells and the google eyed onto the pom pom heads, leave to dry and you have adorable little turtles to play with. Love the idea of this game, super fun in the summer heat, line the kids up, now there are two ways of playing this game. If you have lots of kids you can get two teams to line up. Fill the first persons cup up in each team with water, they then need to pass the water to the next person, over their heads. The team with the most water in the cup at the end of the line wins. The way I prefer to play this is with one line of people and a bucket at either end of the line. The bucket at the front of the line is filled about half way up. The idea is that the water needs to be transferred from one bucket to the other. The first person fills their cup up and then needs to pass the water down the line as before. The last person then dumps the water in the bucket. This version uses a lot more water and everybody gets much wetter so its great for the Summer. I think this version is much more fun. Prepare your area. Lay down some newspaper because this will get a little messy. 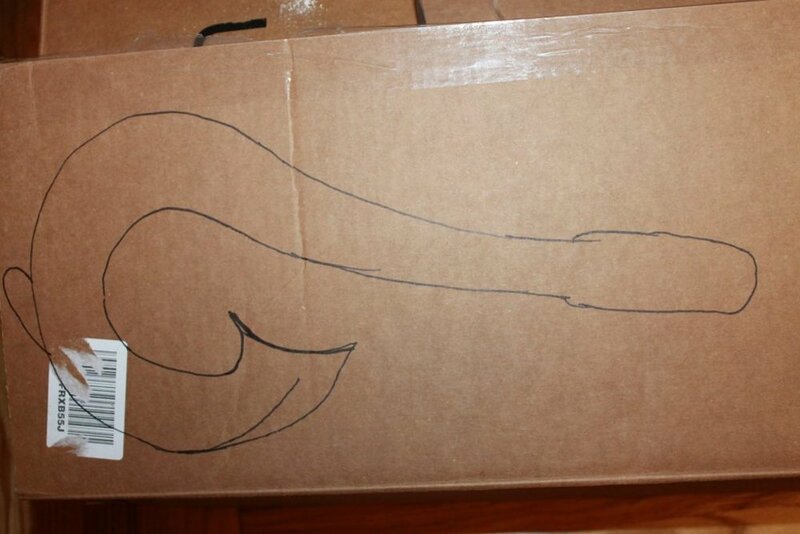 Draw a picture of the fish hook onto a piece of cardboard. We made ours about 20″ long. The handle of the hook should be as long as a paper towel roll. Cut the hook shape out. We used a razor blade to cut ours out. We found it easier than using scissors. Slide the paper towel roll over the handle. Cover the the hook in paper mache. To prepare the paper mache, tear up newspaper into little strips. Mix white glue with water to form the paste. We did about 3/4 glue to a 1/4 water. 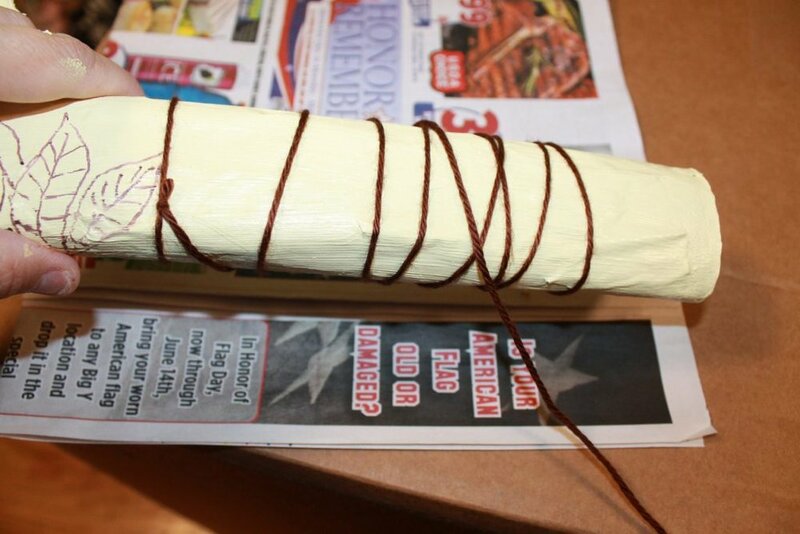 Dip the strips of newspaper into the paste and wrap them around the hook and smooth them out. Wrap the hook to add just a little bit of depth and to smooth out the area at the top of the paper towel roll. Let the paper mache dry. 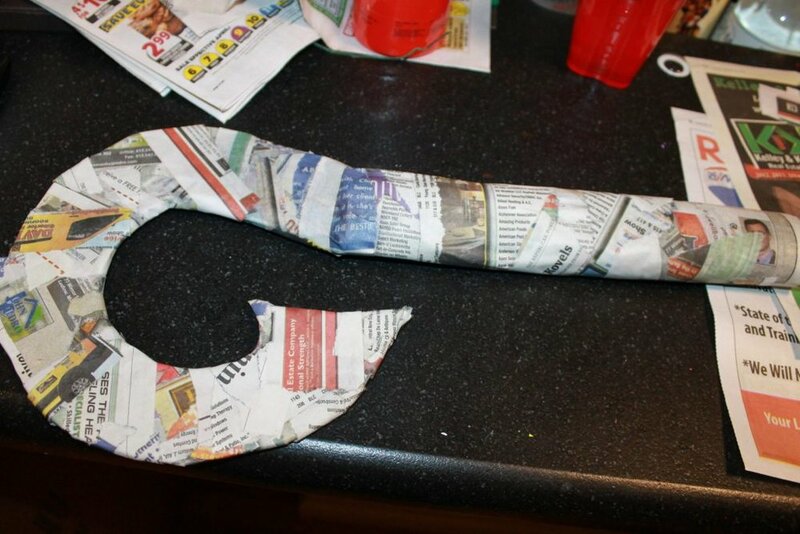 Cover the the hook in paper mache. To prepare the paper mache, tear up newspaper into little strips. Mix white glue with water to form the paste. We did about 3/4 glue to a 1/4 water. 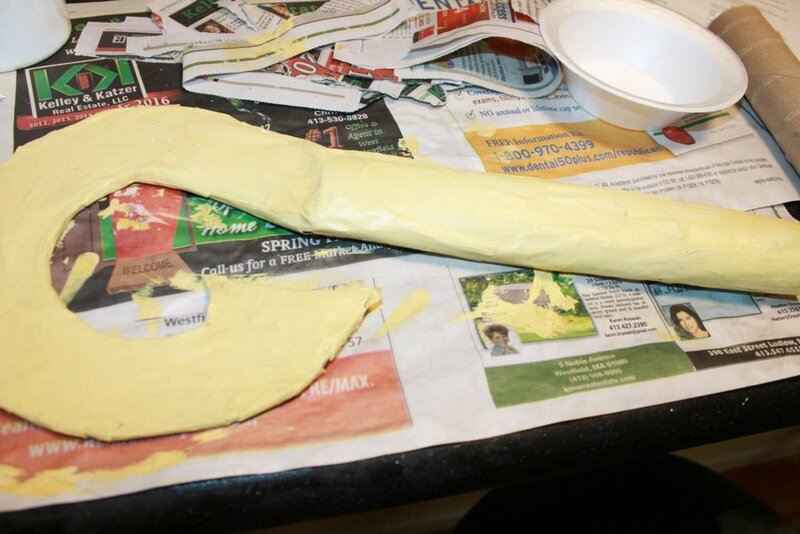 Dip the strips of newspaper into the paste and wrap them around the hook and smooth them out. Wrap the hook to add just a little bit of depth and to smooth out the area at the top of the paper towel roll. Let the paper mache dry. Paint the hook with acrylic paint. We used a light tan color and did three coats. Set the hook aside to dry. Use a marker to draw tribal like designs on your hook. To finish this off just wrap the bottom up with brown yarn and enjoy. This idea is just too cool not to share. 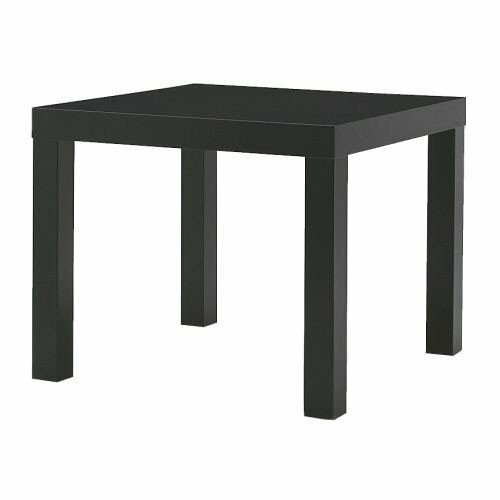 It's so simple too, in the picture they made a basic table themselves but you could just use an Ikea lack table like the one I linked to below. You don't need to have a hole in the table (although I admit it is better with a hole). Some chicken wire and sticks. For the sticks you can use wooden dowels, sticks from the garden centre or depending on the size of your game you may be able to use chopsticks. The chicken wire can be tied together at the rear of the game, put all the wooden dowels into the chicken wire lay this on the table and fill with the balls. Thats it for our Moana fun, check out our other ideas below and come back soon for some brand new themes.